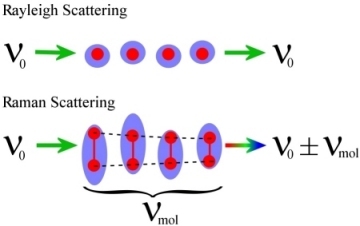 Raman scattering is a special, and very weak, form of light scattering in which energy is lost or gained to a molecule; this process is shown in the figure. The top set of cartoons show the normal scattering of light, referred to as Rayleigh scattering. In this process light incident on a molecule sets the electrons around the atoms moving. It can be considered that the light is instantaneously converted to the movement of the electrons and then converted back into an optical field. In this process the light remains at the same energy but the angle at which the light leaves the molecule can be different from the incident angle. The best example of this is the sky: the air scatters blue light effectively but only scatters red light a little bit. During the day, blue light from the sun that enters the atmosphere is scattered around making the whole sky appear blue (if this didn't happen we would just see sun against a dark background. Red light is not scattered very much, so most of this comes directly to our eyes from the sun - this is not observed, as the sun is too bright to look at. However, when the sun is low in the sky there is more atmosphere between the sun and us so the light is dimmer and the blue light is scattered so much that we see less of it. This allows us to see the red colours more clearly in the form of spectacular sunrises and sunsets. In Raman scattering the process is very similar but there is one important difference. In the instant when the light is scattered the molecule changes its configuration slightly - it might start to rotate or vibrate for example. Now the electrons oscillate slightly differently, and this forces the light scattered from the molecule to be of a different energy: it can be considered that a bit of the light energy has gone into making the molecule move. Since the light interacts with the molecule for essentially zero time this process very weak. The scattered light provides a huge amount of information about the molecule and can reveal its exact structure. Since every molecule has a different structure the Raman spectra can be used to identify the presence of different substances (drug or explosives for example). Unfortunately Raman scattering is such a weak process that it is of little commercial use, and this is where plasmon engineering comes in. It was found many years ago that by placing molecules on a metals surface the Raman signal could be boosted by 1 million times! A process that is now known as Surface Enhanced Raman Spectroscopy, or SERS for short. The reason for this enhancement is to do with the electric field of the plasmons interacting much more strongly with the molecules than light does on it own. Unfortunately, this process is fraught with difficulties as most SERS active surfaces are very random in nature and it is hard to pin down exactly what makes the best enhancement. This is where the surfaces described in my research come in. Since these surfaces are smooth and well controlled, the random variation in the SERS signal of molecules on their surface is very small. The ability to alter the energies of different plasmons is also important so they can be tuned to coincide with the excitation laser or the molecular resonances, or ideally both. In our experiments a plasmon active sample is coated with the molecule Benzene Thiol and placed in a similar set up to the one described previously. Now a more powerful infrared laser is used to illuminate the surface and filters are used to observe only the scattered light at different energies to that of the laser. The process is still weak so everything has to be done is total darkness and a very sensitive spectrometer is used to record the scattered signal. The figure above shows first the plasmon absorption of a sample, as discussed previously, with several strong surface plasmon features. The black cross in the figure shows the energy and incident angle of the pump laser. The second image now shows the light scattered to lower energies by the molecules on the surface. 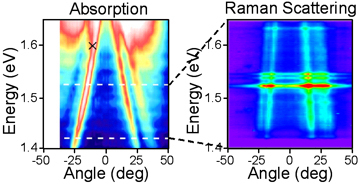 The horizontal bands show the vibratory modes of the molecules and a clear correlation can be made between the first two figures, showing that the plasmon modes are responsible for the enhanced Raman signal. It is also interesting to note that since the different molecular modes are at different energies their scattered light leaves the surface at different angles. The final image show a reconstruction of what the light from the three bands would look like as it comes off the surface (a). Also shown is how the light would appear when enhanced using a localised plasmon, note that due to the symmetry of this plasmon the different coloured light all appears at the same angles, forming a single purple coloured feature. This process can, therefore, be used to effectively detect the different modes of molecular in a quick and easy fashion. 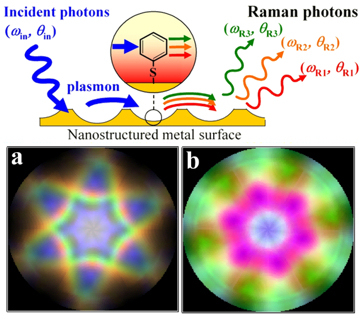 The cartoon shows schematically the process at work, the incident light is coupled into a surface plasmon mode, this then excites Raman transitions in the molecules which produce Raman scattered plasmons. Finally these plasmons are converted back to light and are detected. Due to the reproducibility and level of enhancement this process is becoming a useful means to detect and study trace levels of molecular species. J.J. Baumberg, , T.A. Kelf, Y. Sugawara, S. Cintra, M.E. Abdelsalam, P.N. Bartlett, A.E. Russell. S. Cintra, M.E. Abdelsalam, P.N. Bartlett, J.J. Baumberg, T.A. Kelf, Y. Sugawara, and A.E. Russell. M.E. Abdelsalam, P.N. Bartlett, J.J. Baumberg, T.A. Kelf, S. Pelfrey, and A.E. Russell. Electrochemistry Communications 7, 740 (2005).